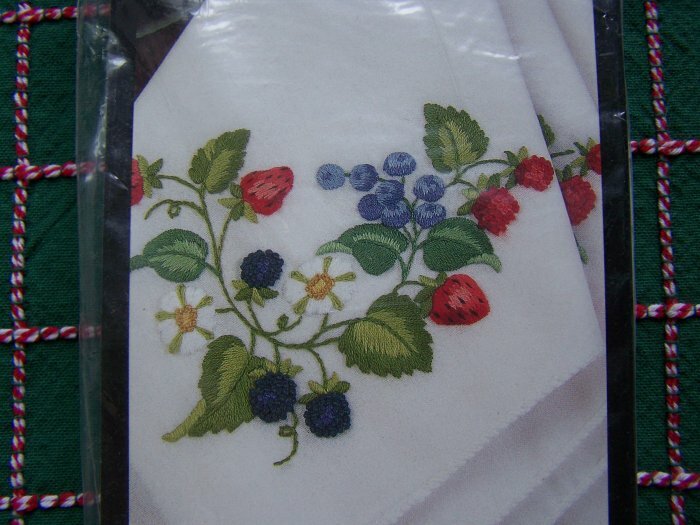 1997 Bucilla stamped embroidery Summer Berries Table napkins craft # 41769. Sealed kit contains stamped fabric (65% polyester 35% cotton) finished with merrowed edges, easy to follow instructions. Machine wash. Size 16 x 16". More new and vintage sewing patterns, crochet, knitting, cross stitch, needlework, quilting, plastic canvas, fabric and more listed..
Measurements: Approx 16 x 16". Set of 4 napkins that you embroider. S & H to USA is $3.00 first class. I use priority flat rate envelopes for $5.00 shipping and can fit a lot of patterns inside. S & H to Canada is $5.00.